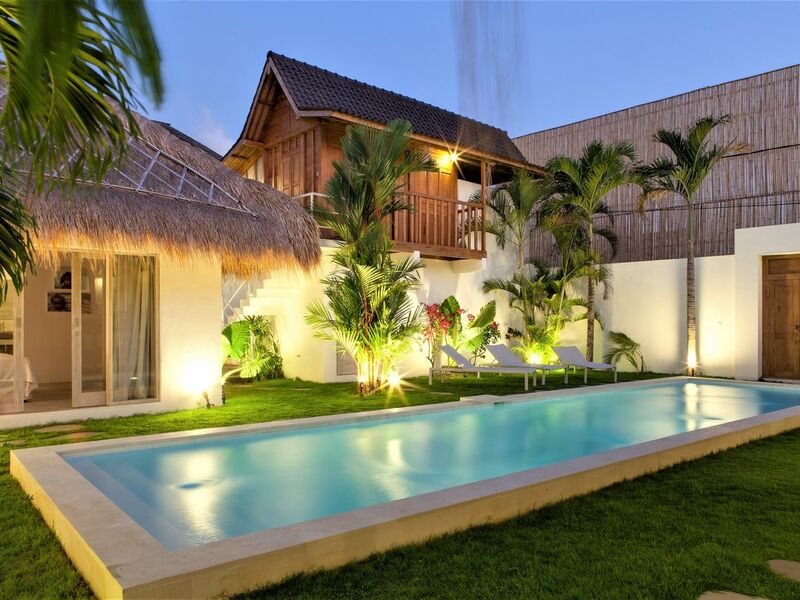 Luxurious 4 bedroom villa with 14 meter pool in Prime Location of Seminyak. The villa is a harmonious combination of modern contemporary design with a touch of traditional Indonesian flavor which exudes comfort in a tropical setting at its best. From the moment you enter the villa, you will be blown away by the way it is intertwined with nature's elements and modern comfort, not forgetting the wonderful swimming pool that will tempt you in for a dip as soon as you enter the property! Starting from the main area, the villa boasts a big semi-open living room as well as a fine dining area covered under a Traditional Javanese Joglo roof with ample of spots to lounge around overlooking the tropical Balinese Garden and turquoise pool. The villa is fully furnished with hand-picked furniture including a fully equipped American kitchen at your disposal for your culinary endeavor. Our sumptuous 4 bedrooms are all with en-suite bathrooms, king beds, air-conditioned climate control, wardrobe area and personal safety box for your items. The rooms are are built in such a way for our wonderful guests to feel as if they are in their own private villa on the property with 2 of it built with the island style “Alang-Alang” roof and the 4th bedroom is a special Javanese handcrafted wooden “Gladak” Room. All rooms are fully equipped and come with private keys and locks. 1 of the bedroom and the living room have direct access to the long turquoise pool so you can pretty much jump in from your bed, we also have laid back bean bags for all your lounging and sunbathing needs. The villa is compact but laid out in such a way to maximize the space and comfort, allowing in plenty of natural light. You will be pleased to know that FREE Wi-Fi service is available in the entire villa as well as TV with DVD player. Daily housekeeping and a free flow of drinkable mineral water throughout your stay is also available. We can arrange any kind of in-villa services or outdoor activities such as, scooter/car rental, babysitter, spa on call, shopping of groceries on pre-arrival, airport pick-up, rafting, quad and many more. There are many restaurants in the area with the option of delivery if you would like to stay in for the day or night. Convenience at its best! The guests have full access to the villa at all times during their stay with us. - In-villa & outdoor activities consulting and organization. - Outdoor activities such as, Rafting, Water Sports etc. Note that although the villa is originally equipped for 8 people, we can also host 2 extra persons for an extra charge of $20/night/person. Sleeping arrangement in that case will be an extra mattress. Towels will also be provided for them. So, we look forward to welcoming you at Villa Taman Eden soon! A few minutes walk from the famous "food street" of Seminyak/Oberoi (Jl Kayu Aya) where you will find a wide selection of the most notorious restaurants in Seminyak where you can discover delicious local specialties as well as international food: Ultimo, Rumours, Trattoria, Char Char Bar and Grill are some of the many restaurants you will find there and they are a delish! Nous travaillons en Tunisie et nous aimons beaucoup voyager nous somme originaire de France de la région Grenobloise. The perfect villa for your stay in Bali without any hassle! Perfect Villa in excellent location!! Perfect Villa in an excellent location, villa was clean and exactly like photos, walking distance to all the action but with out all the noise. We had a pool fence installed as 2 of the little kids who stayed could not swim, management organised this for us which was great!! The villa is very roomy and the garden gets full sun light which is what I was after, the pool is quite deep but it has steps on one side which our 2 and 4 year old enjoyed playing on. House keeper is great, she kept the Villa clean, we didn't get her to cook breakfast for us as we enjoyed eating out. Villa owners are always quick to answer any questions that you may have, also they supplied a cot and high chair which was great for my 2 year old daughter. I would defiantly consider staying here again with a group of people. Thanks so much for having us, we all enjoyed the villa. Es wurde nicht zuviel versprochen. Im Rahmen einer Rundreise waren wir 4 Tage in Seminyak. Das Haus liegt ruhig, aber in 4 Minuten ist die Hauptstraße mit den Restaurants erreicht. Auch der Strand ist nicht weit und wunderschön. Wir haben alles richtig gemacht, vielen Dank! Auch die geforderte Kaution wurde sofort auf unser Konto zurück überwiesen, klasse. Wenn Bali wieder ruft, dann auf jeden Fall auch Villa Oberoi in Seminyak! My friends and I were really impressed by just how beautiful the Villa itself was, the owners have thought about everything and their attention to detail is what makes this villa so superb. The villa itself is beautiful and clean, with an amazing swimming pool and ample space with plenty of areas to chill out and relax. The staff are friendly and professional. There was a lovely lady who came and cooked us breakfast (the first few breakfast's were complimentary!!) and cleaned our rooms every day. In terms of location it is a few 100 metres from the main strip so very convenient with plenty of restaurant and bar options, saying that there is no noise and the villa itself is very peaceful. It is also fairly close to the beach, maybe a 10-15 minute walk, if you don't fancy the walk there are always taxis available and they are very cheap. The villa really is the perfect little haven. I would highly recommend to anyone! We are delighted that you have satisfied the villa. Nous sommes ravi que la villa vous ai satisfait.